Posted on Monday, March 18th, 2019 at 10:48 pm. I was all ready to photograph this wooden bike at the Cal Poly Bike Builders booth when I saw this small-tubed downhill rig chilling front and center. We at Element.ly don’t cover much downhill but a downhill bike is also not a common sight at NAHBS, either. So I decided to take a look. Cal Poly Bike Builders is a mechanical engineering club out of California Polytechnic State University in San Luis Obispo, an uber-competitive public university known for its excellent engineering program that happens to be surrounded with plenty of good riding. I know this well because I really wanted to attend that school. Besides the main show that is the frame, the student-run club manufactures much of the bike including the brakes’ master cylinders, levers, as well as this very nice sounding bell. According to Chris Fedor, the club’s vice president and a 4th year mechanical engineering major, this downhill rig, named D.A.V.E for Downhill Assault Vehicle Extraordinaire, was conceived one week after the 2018 NAHBS. 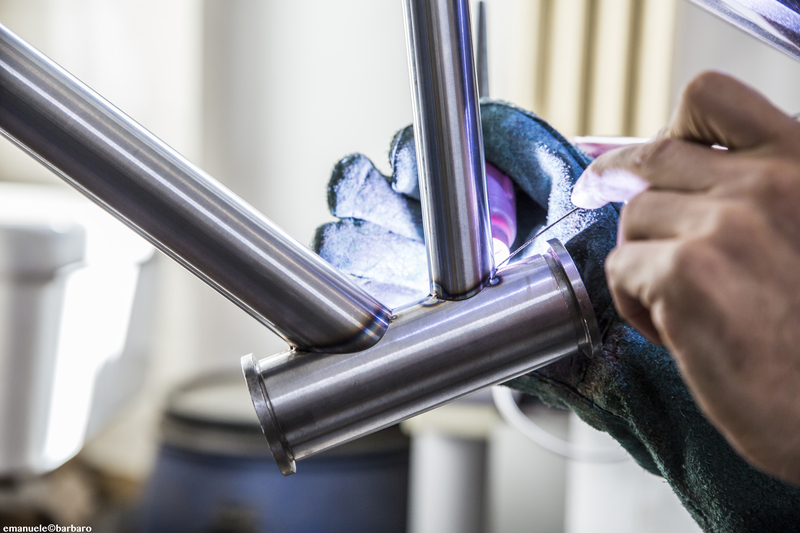 With about 3,000 man-hours of work done by as many as 25 members of the club to manufacture much of the bike from scratch including the use of 3D modeling, FEA, running the CNC machines, and brazing the steel frame together at the fabrication facilities on campus that would make some full-time builders very jealous. Suspension is handled by a Öhlins coil shock and DH fork..
Needless to say, D.A.V.E is one hell of a student project. The bike has yet to see any trail action, per the members’ agreement of not riding the show bike before NAHBS, but perhaps the lead welder will get first dibs? There’s also rumored to be a long waiting list. Yup, they CNC’d their own platform pedals too. Posted on Tuesday, September 26th, 2017 at 9:35 am. 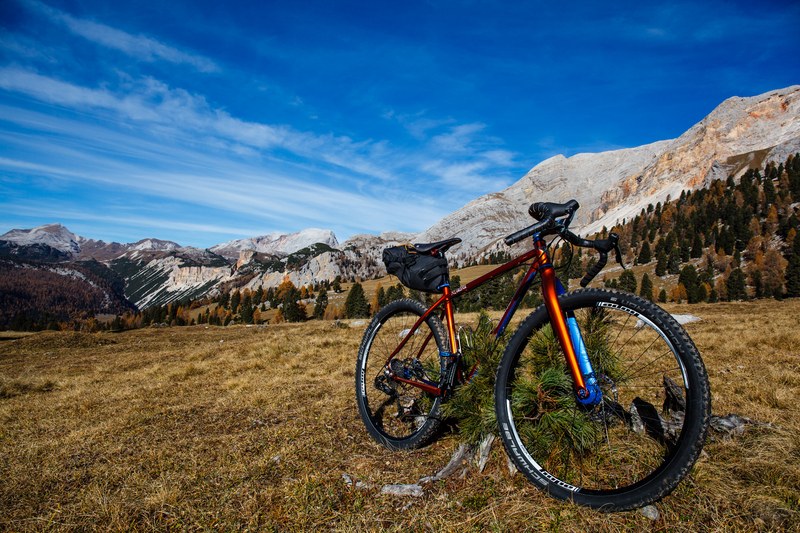 I met Bice Bicycles’ founder (and only employee) Dario Colombo a few years back, on a bike-packing trip from Venice to Turin. He showed up with a big smile and an old Pedersen, a peculiar Scandinavian rig with a cantilevered frame and a hammock-style saddle, complete with a set of modern pannier bags. It made a good first impression. As we rode along the banks of the Po river, he talked enthusiastically about his business building steel frames, getting away from the homogeneity of the modern bike market by making products that would last and that could be tailored to each rider’s ability and needs. This also made a positive impression. When we got home, I promised, we’d talk some more. So this chat is long overdue. Like a dating profile? 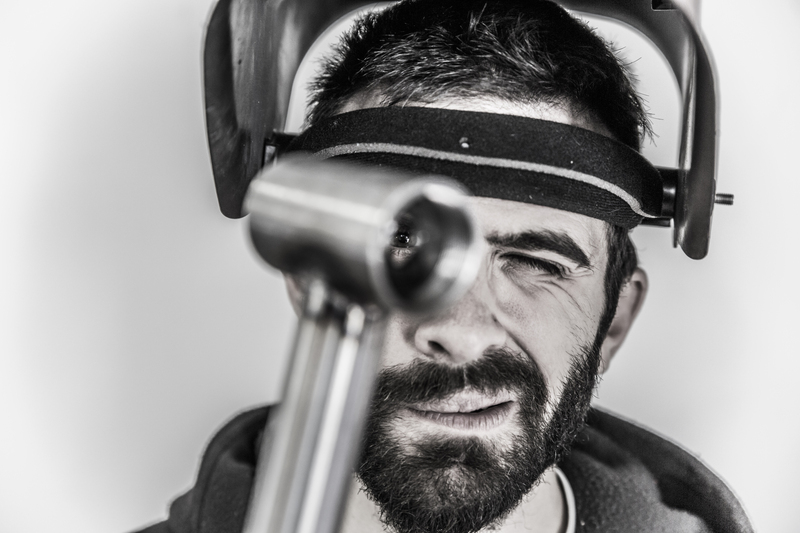 My name’s Dario, I’m a nice guy, handsome, hard-working, a generous lover [laughing] … Before becoming a frame-builder, I worked as an electronic engineer for Siemens, and as an environmental engineer, working on the development of cycling in the city of Milan. I also worked at a biomechanics lab specialising in sports, and as a teacher on sustainability and smart cities, when I opened four cycling workshops around Milan to help young people repair their own bikes, have some fun, and maybe discover a future career. Aside from the work, I suppose people would call me a Xennial, I’m still young, but old enough to remember rewinding my cassette tapes with a pen. I’ll happily drink beer but I prefer wine, in my part of Italy we say “La birra fa pisciar, il vino fa cantar,” – Beer makes you piss and wine makes you sing. I prefer mountain climbing to sunbathing and beaches, and I love music and cycling, obviously. If you made me choose between a concert and a bike, I’d tell you that I was riding to the gig. I actually did it last year when Dub FX played in Sestri Levante, on the Ligurian coast, I think it was more than 2,000 metres of climbing over about 220 kilometres. When did you get into bikes? Let’s say that before 2007, I wasn’t a cyclist. I went for a ride every so often, but nothing special. That June I went on a cycling trip to Provence with eight people and it changed my way of seeing the bicycle. From then on I started to bike-pack and to use it constantly for commuting and fun. I never had any grand delusions – if you saw my Strava you’d know what I mean – and I’ve always just seen the bike as something to have fun with and as a means of transport. I’m a committed singlespeeder, but at the same time, I don’t dislike innovations like e-bikes, especially not when you’re talking about something like a cargobike. Why did you start making frames? It was a gradual thing. Aside from my professional experiences, it began as an experiment, I just wanted to be a part of the bike world. My previous jobs were all positive experiences, but none of them really felt right for me. And I’ve always enjoyed creating things from scratch – but never to assemble them – and I liked bikes. It seemed like an obvious fit. I started out modifying an old Leri frame, turning it from road to pursuit, changing the geometry and the rear end. The funny thing was that, even if it was a game to me then, before beginning that frame, I built a rig that I continued to use for three years. That first one was finished on Christmas eve, 2011, it was snowing and as is the tradition around my home town, there was a guy dressed as Santa doing the rounds, handing out presents. Meanwhile, I was flying around on my homemade track bike, it was such a weird beginning that I felt like it could only be a good omen! What was the hardest thing about starting out? Learning everything from scratch, self-taught, and above all, learning from my (many) mistakes, without letting them discourage me. In Italy, old frame-builders don’t have the money or the time to invest in young people, to pass on their skills and knowledge – even though a lot of them want to. So I wasn’t able to learn as a proper apprentice, and I could only get the knowledge by asking questions, listening, and watching. I came home several times after a day spent by with a frame-builder, only to completely change the whole workshop and machinery – as well as my mental modus operandi. Another big difficulty is knowing the value of a firm “NO”. Involving the customer in the building process is an great experience for both parties, but it needs well-defined limitations if I’m to enjoy my work and they’re to get the best possible end product. But it’s a work in progress – I’m always learning! Have you changed a lot? So much. Every encounter with a frame-builder corresponded to a lesson in technique and in life. How to point a chassis, what type of welding alloys to use, how to TIG weld, how to set up the workshop to optimise my space, how to approach customers. Not to mention the type of frames: at the beginning I didn’t even have a real price list, but now I’ve got a series of models that I’ve developed based on my experiences. I started with 29er frames and then moved on to touring, CX and most recently to the gravel and bike-packing scenes. Roughly, that corresponds to my personal cycling life. One thing hasn’t changed: my desire to adapt and improve. Experimenting with new techniques and new tubing, for example, is an everyday thing for me, but it has nothing to do with market demand or programmed obsolescence. It just reflects my desire to keep moving and getting better. The average customer is somewhere between 30 and 45, they generally have a lot of cycling experience, and are fed up with the modern “disposable” world. They don’t mind waiting four months for a truly custom frame. What’s the difference between that and one off the shelf? Well, you know who made it. You know it’s real. Cycling has changed so much in recent years. Where do you see it going from here? The modern bike industry is a child of our times: there is such a huge supply of products and a lot of the history, emotions, and memories, are being annihilated by increasingly heavy marketing campaigns. A year or two on from the presentation of a new model and it’s already “old.” Just one financial mistake, a speculative move made on the other side of the world, and a historic brand disappears. But I think a lot of people want to distance themselves from all that. I certainly do.